The Connecticut Pro Chapter of the SPJ sent two delegates to represent our chapter (number of chapter members determines who many delegates each chapter gets) at the Excellence in Journalism 2018 national convention in Baltimore. This year’s delegates were Bruno Matarazzo, chapter president, and Viktoria Sundqvist, vice president of programming. – NAME CHANGE: A resolution to have the board of directors investigation and come up with a complete proposal for a potential name change of the organization from Society of Professional Journalists to Society For Professional Journalism was proposed and debated wildly but ultimately failed. The proposal would have directed the board to look into costs associated with a potential name change and would have forced the board to present a plan at next year’s convention. Opponents said this issue has been discussed and rejected before and we should stop wasting time on it. – SPONSORSHIPS: A task force will be created to look at entities whose actions are at odds with SPJ’s journalistic mission in terms of getting sponsors for next year’s conference (Sinclair and Koch were alluded to as they were prominent at this year’s event, which had raised some concerns). 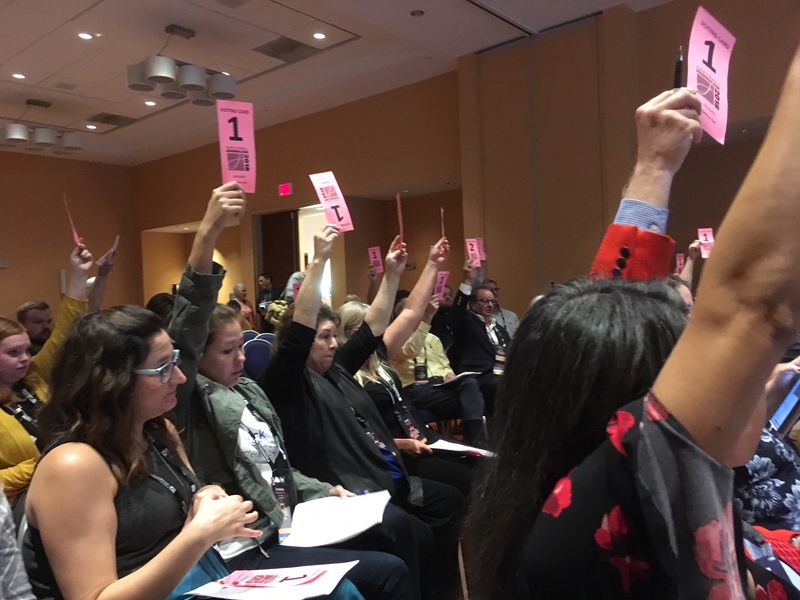 The task force was already created, and this resolution – which passed overwhelmingly in a voice vote after some discussion – is reinforcing the task force’s mission and will use the SPJ’s Code of Ethics as a guide to vet donations. The group plans to present findings to the SPJ board of directors by Dec. 1. – CONDEMNING THREATS TO BAN ACCESS: Resolution passed to condemn Oklahoma State University football coach Mike Gundy’s threats and efforts to keep reporters from doing their jobs. – STUDENT NEWSROOMS: Resolution passed to publicly say SPJ supports #SaveStudentNewsrooms movement, support advice, counsel and legal support where appropriate. The resolution also calls on institutions of higher education to help ensure student news organizations remain editorially independent. – HURRICANE COVERAGE: A resolution to call on TV stations and networks to stop ordering or permitting reporters to stand unsheltered in hurricane zones was rejected in a voice vote. The resolution would have also called on network to stop dramatizing weather events. Opponents were concerned about SPJ ordering certain newsrooms how to handle their coverage and some found the language of the resolution insulting. – REALITY WINNER: A resolution to urge President Donald Trump to commute the sentence of former NSA contractor Relity Leigh Winner passed in a voice vote. Winner is serving a five-year sentence in federal prison for releasing unauthorized government information to the media and the resolution says over-classification of documents has become a real problem. – IMPRISONED JOURNALISTS: A resolution to denounce the imprisonment of, and calling for a full pardon of, Reuters journalists Wa Lone and Kyaw Soe Oo passed in a voice vote. – RETIRED JOURNALISTS: A resolution to establish a national contest specifically for retired journalists failed in a voice vote. Resolutions committee recommendation was unfavorable as any journalist who publishes work, whether full-time, part-time or retired, should be able to enter all current contests and there was concern over the extra work involved with starting another contest. – HONORS: A resolution to recognize the contributions of Fred Rogers to human development and public TV passed; A resolution to remember the late Richard D. Hendrickson and his passion for journalism passed; A resolution to honor Rebecca “Marvel Girl” Baker as outgoing president passed; and a resolution thanking all staff of SPJ for a successful conference passed. – BYLAWS: A change in the bylaws passed to move funds related to the Quill magazine from the SPJ side to the SDX foundation side of things since the foundation manages the magazine. A second vote to complete this change will be needed at the next convention in San Antonio, Texas. – NEW FINANCE RULES: Due to a financial issue at Region 10 in the past year, new finance rules have been approved and are being implemented across all chapters. It will include quarterly financial reports to the regional director and stricter approval process for all expenses and reimbursements. – ELECTIONS: Our own Mike Savino was elected to the national board. Jane Primerano was re-elected as Region 1 coordinator (formerly regional director, title change due to last year’s bylaws vote). Connecticut alumna Rebecca Baker finished her term as president and the new national president is Alex Tarquinio. Read about all candidates here.